Over the course of the past two days, Emily and I had the opportunity to visit several more businesses with our Business in Scandinavia travel course. SAAB Defense stuck out as a business who really value their human capital and put in a lot of effort to obtain and retain employees. We spoke to Bertil Hellström, the head of government affairs and market at their world headquarters in Stockholm. He mentioned that SAAB’s strategic priorities are built on its people. 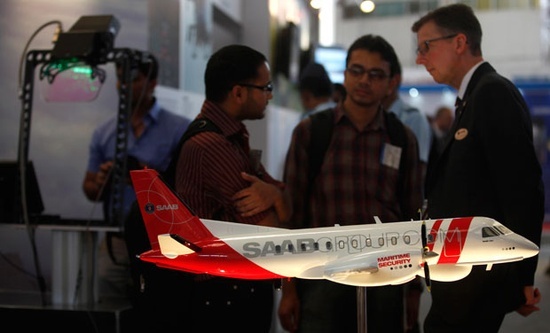 SAAB climbed in the best workplace survey by Universal from 25th to 8th in 2012. Hellström emphasized that in order to retain the best talent in Sweden they have a collaboration with the universities and recruit regionally. As they broaden their portfolio they are finding a need to attract more individuals focused not only in engineering, but also in political science, economics, law, and finance. In 2013 they recruited over 400 individuals from the universities in Sweden alone. Upper management has a goal of having 30 percent of all managers to be female by 2015. Currently they are at 26 percent. One of the challenges is that being an engineering company, the universities are dominated by men in these specialties. The company feels that by reaching this goal SAAB will be a more balanced company. We think that SAAB Defense has a definite challenge ahead of them given their rapid growth and heavy dependence on recruiting at local universities, but after speaking with Hellström, it seems that management is poised to become a more balanced company.